Roberto Baggio, born in Caldogno, north Vicenza in February 1967, has been one of the best players in the world through out the 1990s. He started his career in Vicenza back in the 1982/83 season, and stayed there for three seasons until he was picked up by Fiorentina in 1985. It was from there he started to show his true potential. In the 1988/89 he won his first cap for Italy after having a very good season scoring 24 goals in 40 games in Italian football (league/cup). The following season was even better, Baggio knocked in goals for fun and Fiorentina couldn't afford to keep him. The big clubs in the north were prepared to put the big money on the table. It was Juventus who finally got him for a world record fee of £7.700.000 in the summer of 1990, just before the World Cup on homesoil. 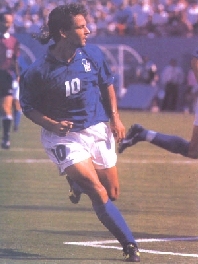 Baggio scored two goals as Italy went on to get bronze, after losing on penalties in the semifinals to Argentina. He spent five seasons in Juventus. Five great years for him, as he won the Serie A, Italian Cup and UEFA Cup as well as been voted "World and European Player of the Year" in 1993. Baggio's best World Cup was in 1994 in the United States. After a slow start he woke up in the second round, scoring twice against Nigeria, then once against Spain in the quarterfinal, and two more in the semifinal against Bulgaria. 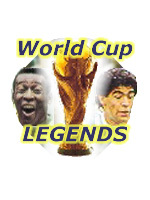 In the final against Brazil he missed a penalty in the shoot-out which saw Brazil win the World Cup for the fourth time. Since then, Baggio has been in and out of the Italian squad. He was dropped from the EURO 96 squad by Arrigo Sacchi, but made Cesare Maldini's France 98 squad and played in several games although not with the same class as four years earlier. He has since played for AC Milan winning the Serie A once, and also in Bologna, Inter Milan and Brescia where he seems to end his career.